The property contains the botanical garden which is full of winding paths, greenery, beautiful 13 year old geranium plants, a Parisian Garden, vine-covered arbors, fountains, water features, ponds, a wedding chapel with a bell tower, and a 117 year old guest house, all of which are available for rental and use for wedding events. One of the more novel attractions at the Garden is the Wine Garden. I say it’s novel because it’s actually a vineyard! The entire patio is covered with a grapevine canopy that produces real grapes in season and has string lights for nighttime events, all with Italian music playing for background ambiance. Another noticeable thing about Steve is his impeccable professionalism. This guy knows the wedding industry and knows how to take care of a bride and groom and their families at his full-service venue. As a landscape designer, he has put so much sweat equity into creating The Secret Garden, and it immediately shows when you see it all. Even on this spring day in April, when so many trees were damaged from the snow load, the Garden still stood out in the city as a little oasis. My favorite spot was the Parisian Garden, and here Steve even had the creative foresight to build a layered platform with an iron-columned gazebo on it so that when the bride & groom stand there for the wedding, it represents a layered cake with a bride & groom at the top. The main property is intentionally designed with lots of paths that wind through the trees and shrubs and under the arbors so that it will hold his clients’ interest and encourage them to explore. This also allows for creativity in the wedding ceremony because the attendants and the bride and groom have numerous options for their entrances and for the wedding party recessional. One of the most popular spots for the bridal entrance and for the wedding photos is the grape-covered colonnade just inside the entrance to the property. All of the natural, organic environment is refreshingly unique about the Garden as a wedding venue, which are typically static rooms that never change. Every day at the Garden brings a new look, so effectively no two weddings ever look the same. Each of the outdoor wedding areas – the main Garden, the wine garden, and the Parisian Garden, are all hedged with natural plants so you don’t have onlookers watching your wedding. You have a secluded, private ceremony in your very own Secret Garden. The guest house is available for out-of-town wedding guests and has 2 bedrooms and an updated, modern bathroom. If you have friends or family coming into town, and they need a place to stay, the guest house isn’t exclusively for wedding guests. Anyone can reserve this well-maintained cottage originally built in 1900 and equipped with some vintage appliances like the antique heater (just for show) and the refrigerator from the 1940s. Nearly every person who works in the wedding industry has a story about some crazy couple, family, or event. Steve’s most unusual wedding request was when the bride & groom told him that they wanted to have a pig be the ring-bearer. As Steve said, “When they’re scared, pigs make a horrendous screaming noise!” He had no clue who was screaming so alarmingly and ran over to find a panicked pig. He’s also been asked to officiate a wedding on a couple of occasions, but he readily admits that is not one of his career ambitions or talents so he has never accepted one of those invitations. Steve has seen numerous flubs in wedding plans, but one major tip he has is that couples should choose the venue before choosing the date. So often a couple chooses a date, and if they happen to choose a popular date, such as July, 17th, 2017 (7/17/17), the more popular wedding venues may have been booked months in advance and the couple may not have a nice place to host the wedding ceremony. Homestead Roofing worked for Steve in 2014, re-roofing his home, so I’ve had 3 years to get to know him. If you know of someone who has an upcoming wedding, and they haven’t yet chosen a venue I can definitely recommend you check out The Secret Garden and spend time discussing your plans with Steve Muzzipapa. 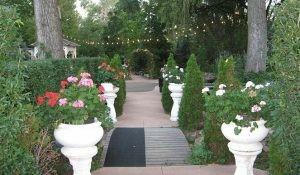 To get more information about The Secret Garden, go to the website, coloradosecretgarden.com or call him at 719-964-0541.